Happy Sunday everyone! End your weekend with these yummy donuts. These soft, sweet, rings of deliciousness will have you sneaking more than just one. Truthfully, it's like biting into a pumpkin pie. Yes, they are that good. The best part is they are baked NOT fried. Tip: Dunk the donuts in the maple glaze and let sit for 5 minutes. Then, glaze donuts for a second time. 1. Preheat the oven to 350 degrees. Be sure to spray donut pans well! 2. In a large bowl, sift flower, sugar, baking powder, pumpkin pie spice and salt. 3. In a small bowl, whisk together the egg, milk, melted butter, and vanilla. 4. Stir the wet mixture into the dry mixture. Just until all ingredients are combined. 5. Spoon batter into baking pans. Fill to about 3/4 full and bake for 17 minutes. 6. Allow donuts to cool and then brush donuts with the melted butter and coat them in the pumpkin pie spice sugar mixture. 7. 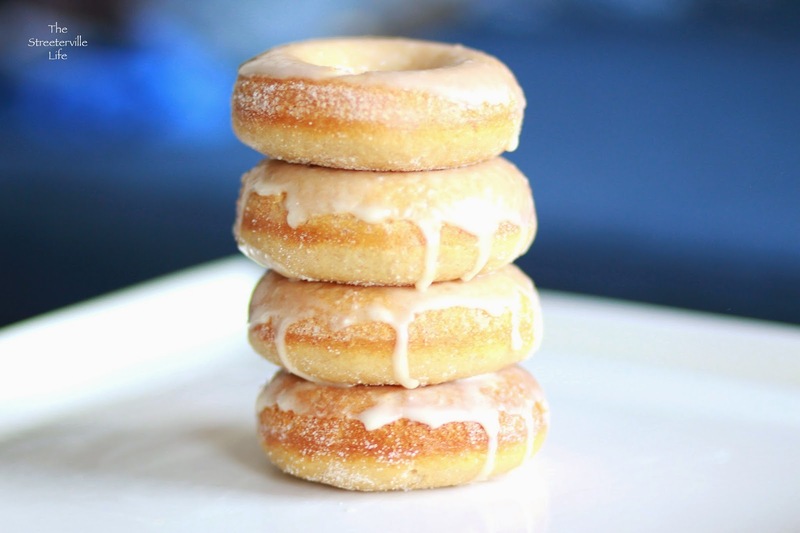 Lastly, drizzle donuts with the maple glaze.